Karl giving Lil and Dylan an extensive list of Paul's injuries. Karl and a nurse are checking Paul over, and he seems slightly delusional, not knowing what is going on. 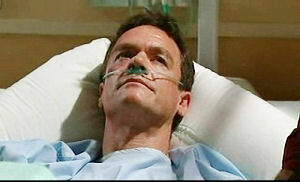 Karl tells him he is in hospital and he had a very bad accident. Karl tells the nurse not to leave him, and he leaves the room. Susan (who, incidentally, is not wearing a tent – hear the Susan Fans cheer!!!!!) is in the hallway, and Karl calls out to her. She is off to see Darcy, and Karl comments that she can't help herself. She asks how Paul is, and Karl replies that they are pumping him full of antibiotics but nothing seems to be working. KARL: I tell you, the pain he's going to experience? I wouldn't wish it upon anyone. Boyd is all decked out in his aikido gear, and easily beating Stingray in a one-on-one. Janae yells out accusing Stinger of nicking $10 of hers, but Stingray said he didn't. Boyd says he can see why Serena misses him – he has such a stable, well rounded family and everything. Stingray says he meant he shouldn't have left her in the shizzle – right in the middle of her parents breaking up. He says he just wants to help her. Boyd suggests bringing her to an aikido class. STINGRAY: Nah, she's more like a Bridget Jones than a Kill Bill. Boyd tries to tell him it's not about that, but Stingray says it sounds a bit light on the gags. Boyd replies that if Serena sees him get thrown on the ground a few times she'll be laughing all right. Janae comes out and has found her money. Boyd tells Stingray to go and get dressed – class starts at half past. Janae can't believe Boyd has invited Stingray and Serena to the class, but Boyd says it is just what Serena needs. JANAE: She needs something. Why does Scotty have to bludge off our fun? BOYD: It's called sharing, Janae. Stu arrives home and Sindi bustles out of the kitchen with a fresh home-made batch of cookies. Stu takes one with a half hearted ‘ta' and Sindi asks if he is tired. Stu says he isn't – he just went to pick her up from the hospice. Sindi looks slightly worried, even more so when Stu says he saw Kelly – and they had quite a chat. SINDI: What did you talk about? STU: You and me, the dozen red roses I send you on days of the week that have an ‘s' in them, the remarkable fact that I have SIX TOES ON MY RIGHT FOOT! STU: VERY CONFUSING! To learn that without my girlfriend, I wouldn't have my job with the FBI, I'd be in the gutter – blind, and in the gutter. SINDI: (happily) Yeah, Kelly really loves that bit, doesn't she! Stu asks how she can lie to her friend like that, and Sindi replies she has nothing, and she lives for Sindi's wonderful stories – she can't tell her about her real life, it would be too boring. Stu says it's nuts, but Sindi says it isn't – the nurses say the only time they see Kelly laugh is when she visits – that she is better than an anti-depressant! SINDI: She lives through my life, and the more romance, the better! Sindi says in all her stories, at the end of the day they always fall into a passionate embrace – where's the harm in that? Nobody's hurt, and everybody's happy! Serena is hanging some clothes out as Stingray is trying to talk her into coming to the aikido class. She doesn't want to, no matter how many times Stinger tells her it will be fun. Boyd and Janae come into the yard, and stingray tells them she won't do it – Serena says she's not in the mood. Janae isn't bothered, but Stingray says it will help her – ‘take that, Lil! Take that, Dave!' Serena isn't impressed, and Stingray apologises. Boyd says aikido is about clearing your mind so you can think of things outside of yourself, but Serena still isn't interested. They go to leave, but Serena grabs Stingrays arm and twists it. Sindi is asking Stu if he is over the whole Kelly thing now. Stu says he is – whatever relationship she has with her poor friend Kelly, he won't judge it. Sindi asks if he trusts her, and he says of course he does – they're getting married! He will even tell her a secret if she promises not to tell. There is an opportunity coming up for some extra training – not the FBI, but some undercover work. Sindi asks when he starts, but he says he has to get the gig first – he's up against Trent Hoffer, some big burly boofy guy. Sindi says he won't get it – he's as dumb as two short planks, but Stu says he isn't the most popular person after the whistle-blowing incident, and even though it is unfair, that's the way things go. Janelle points out that it isn't long now until she and Bree will be on their very own road trip – Thelma and Louise eat your heart out! JANELLE: Why don't you ask Susan? BREE: Fine – I will! Janelle says it'll be their very own road trip – the wind in their hair…Bree says that's why she's reading Myles Franklin – Susan says her birthplace is a couple of hours out of Canberra. Janelle thought they might be able to go see the Big Trout – she wonders if there is rides there like at the Big Banana, but Bree thinks it is terrible they spend money on tourist traps like the Big Trout, Banana, and Pineapple, when things like Ned Kelly's house are rotting away. JANELLE: I wonder what Susan thinks? BREE: Susan thinks they're a Total. Joke. Paul thanks Stu for coming to visit – he really appreciates it. He asks if anyone else has sent any messages, and Stu replies none that he really wants to hear…Stu is his only visitor. Stu says he just wants to say he doesn't know what to believe about what he has done, but he does know that if he hadn't provided the cash for his operation, he wouldn't be standing there looking at him. Paul looks up at him, and then flashes back to the match lighting, and Lassiters on fire. He looks sufficiently guilty, and says to Stu he didn't deserve it (the blindness), and he is so sorry. PAUL: (delirious) Did anyone send any messages? Stu says no – he already told him that, and Paul rips the tube out of his nose, muttering that his mobile is going – that could be ‘her' calling me. Stu tries to stop him, but he throws back the covers and stands up, collapsing against Stu. Karl comes running, and they lift Paul (who is CladInA….VerySnazzyHospitalGown!) back into bed. Karl says he suspects Paul has rebroken his leg. Janae and Boyd are in the middle of aikido class, practising a move, when the instructor comes up and tells her to use Boyd's energy, not her own. The instructor then moves on, and reaches…Stingray and Serena! Stingray pulls some very … err … impressive? … kung-fu moves, and falls flat on his back. Serena and Mr Instructor don't look very impressed. Bree asks which book she should take along to Canberra, and Susan says neither – take something really trashy – there is only so much your brain can absorb. Sindi comes running out and says she is very sorry to I-N-T-E-R-R-U-P-T, but can she please borrow the car – she has to pick up some shopping, and couldn't bear the bus. Susan says it is fine, and Sindi leaves. Bree tells Susan she feels like she is bludging reading something trashy, but Susan tells her the competition is supposed to be fun. SUSAN: Well, win or lose, you've gotten this far and that's something you should be very proud of. Bree tells Susan she wishes it was just the two of them going to Canberra. Susan asks what about the new car, but Bree would rather Susan's any day. Susan says Janelle is very proud of Bree, and she has to let her show her that. Janelle bursts through the front door and Susan says they were just having a last minute bit of cramming. Janelle says Summer's waiting for Bree, and Bree leaves. Janelle tells Susan that Bree thinks the sun shines out of Susan – everything is Susan this, Susan that. Susan says Libby was like that with a teacher once – drives you mad doesn't it? Janelle hints that she wants to take Bree to Canberra on her own – it would give her a chance with Bree, who she feels doesn't think she is a good mum. The instructor calls for a volunteer, and Stingray puts his hand up. The instructor throws him around a bit, and Serena finally cracks a smile. They take a break, and Janae snipes to Boyd about Serena, and Stingray ‘finally making the moll smile.' Boyd says that something had to work. Janae smirks. The instructor comes over and tells Boyd he should think about who he brings to class, and also that they need to be sure they want to commit to this – relationships in class are strictly forbidden. Boyd and Janae assure him they aren't together – they are here for the fitness etc. The instructor tells them without commitment they are wasting their time. Susan apologises to Bree – it's just with the big move and everything…Bree isn't impressed, but Susan tells her she knows she will do well, and she's a good girl. She reminds her to try and have fun! Sindi is washing Susan's car, and Susan points out she only had it for half an hour! Sindi says it is a thankyou for the loan. She bends down to scrub the number plates, which are soaking in a bucket, and Susan asks if she's sure she isn't going a *little* over the top? Sindi says they were filthy, and she couldn't have her driving around with dirty, filthy number plates. Susan groans as she spots a big scratch on the side of the car, and asks if it is new. Sindi says Stu pointed it out weeks ago. She asks Susan if she can keep a secret, and tells her about Stu's promotion – but she can't say what sort, it's ‘highly confidential' *cough* Sindi says he has got it – it's in the bag. They talk about how much Stu deserves the job, when he comes out. Susan leaves them to it, and Sindi asks Stu what is wrong when she spots the look on his face. He tells her that Trent Hoffer – his competition for the training gig – got knocked off his mountain bike in a hit and run, and is in a pretty bad way. Sindi asks what that means, and Stu half heartedly says it looks like the job is his. Sindi gets excited for him. Janelle is telling Bree not to worry – they'll have fun just the two of them, and she can pick the CD's for the whole way, and she won't hear a peep out of Darrel Braithwaite. Bree yells that she hates her, and Janelle asks if she still wants to go. BREE: Yeah – on my own! I'll hitch! JANELLE: Why do that when we've got the nice new caaaar? BREE: Ok, but if you walk in there and you hear me spell, I'll walk out – got it? Janelle rounds up the troops for dinner – Serena is over too. Janelle asks Serena how school is, and Serena says they are packing on the work for year 12. Janelle reminds Janae that will be her in a couple of year's time. Janae tells her she has got an assignment – to make a documentary about anything she wants – not ‘Life in the Zoo' as Bree suggests. She has decided to film the spelling competition, and Janelle is proud, but Bree is mortified. Janelle says it shows family solidarity – something poor Serena isn't getting much of…Serena looks up. STINGRAY: Oh whack Mum – that was subtle! JANELLE: How is your Dad, love? Still off his tree? JANELLE: What? You know what I mean, don't ya love? I mean, it's your mum I can relate to – fallin for a con artist – I coulda told her he was shonky! JANELLE: Oh, sorry love – I open my mouth and my foot comes out! Everything'll be alright though – I mean, he's a funny bloke, your Dad, but he's decent at heart, and, well I know that now. Plus – he's single, and God knows, there's not enough of that about! Karl says it is ironic – he's trying to keep alive two people who have inflicted so much pain upon his family. Susan points out that you wouldn't wish pain upon anyone. ‘Not even if they are bound to do it again?' Karl asks. He is talking about Darcy. Susan says he was devastated when she told him what he'd done, and Karl says he could be faking it. Susan says they'll find out sooner or later. Karl asks how the move is going, and Susan says it is going very well. Karl tells her she'll be missed and leaves. Stingray has Janae's aikido outfit on, and she is trying to get it off him. Janelle says not to get anything on it – she's taking it back to the shop as soon as they get back from Canberra! Janae complains, saying if it was Stingray she wouldn't take it back. JANELLE: Oh Janae, that's enough! I can't even hear myself think! JANAE: Like that's a loss to mankind! JANELLE: Janae, any more lip from you and I'm tippin you out on the Hume! Stingray answers a knock on the door. It's the Repo man!!! Stingray loudly repeats the man's name and tells him to wait there, while he closes the door, and sounds the warning – REPO MAN! Janelle says to stall him, and they'll make a run for it. They grab some clothes from the clothes basket on the table, and escape out the back door, while Stingray tells the Repo dude Janelle is a little indisposed right now – she's on the loo…number two's! The guy says he didn't appreciate being spoken to like that on the phone to Janelle, and Stingray sympathises with him, buying Janelle and the girls some time. Out the back, the girls and Janelle toss their luggage over, then jump the fence, Janae complaining all the way. Karl is drawing blood from Paul, and tells him they are trying to find the right antibiotic. Paul asks if there have been any messages or visitors, and Karl asks does he care? Paul says only about one, and Karl replies he hasn't heard from her. Stu and a RandomExtraPolicewoman come in, and Stu asks Paul if he has heard of a company called Affirmacon. Paul says he has, as Stu informs him they are currently being investigated for fraud – Erinsborough council is seeking damages. Paul asks why don't they speak to Affirmacon, but Stu says they can't – their Australian holdings have been dissolved – there is no one left – all the directors have vanished overseas. PAUL: And here lies the Patsy.